UL, CUL (Canada) and California State Fire Marshal listed. 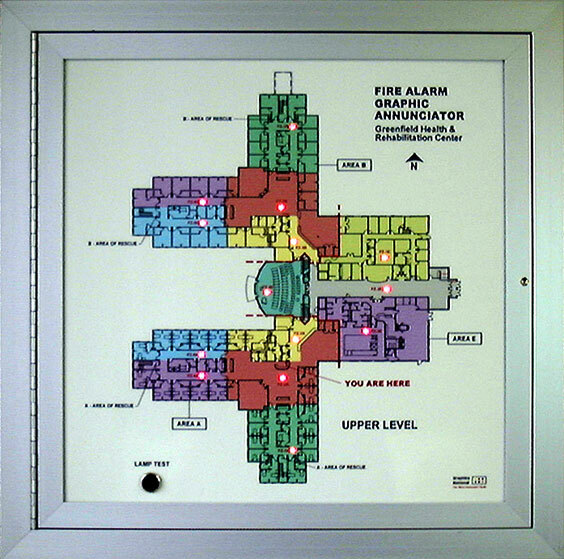 A Fire Alarm LED Graphic Annunciator / Mimic Panel is an important component of today’s Life Safety Systems. 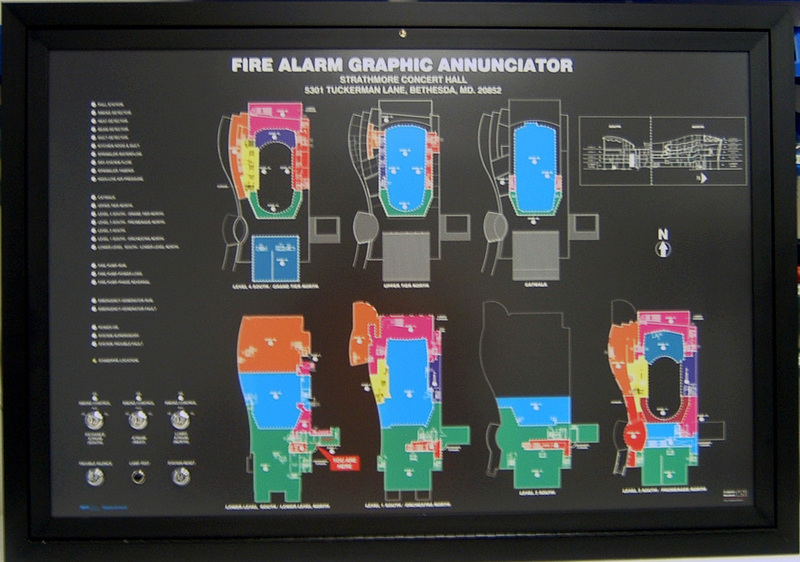 A graphic display is the most effective method to quickly convey critical information to the people who must respond to alarms. 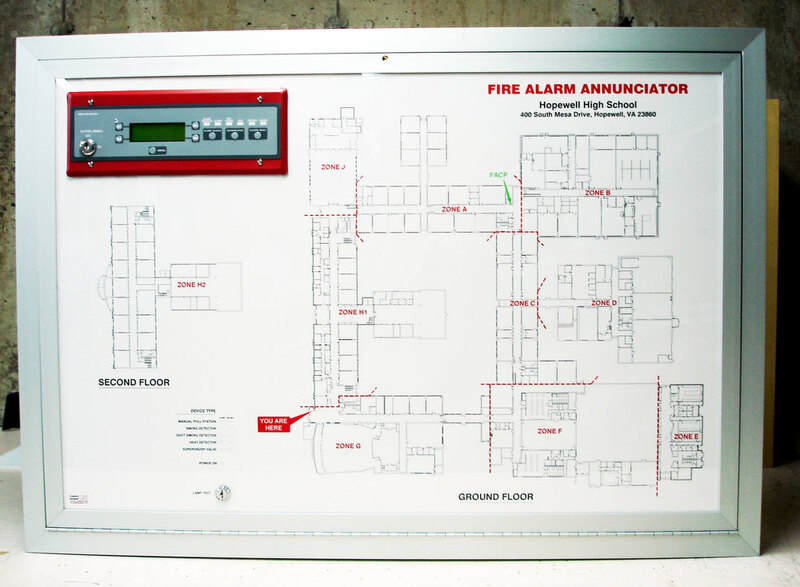 Graphics National custom Graphic Annunciators are a cost effective and easy solution to last minute graphic changes or building modifications. 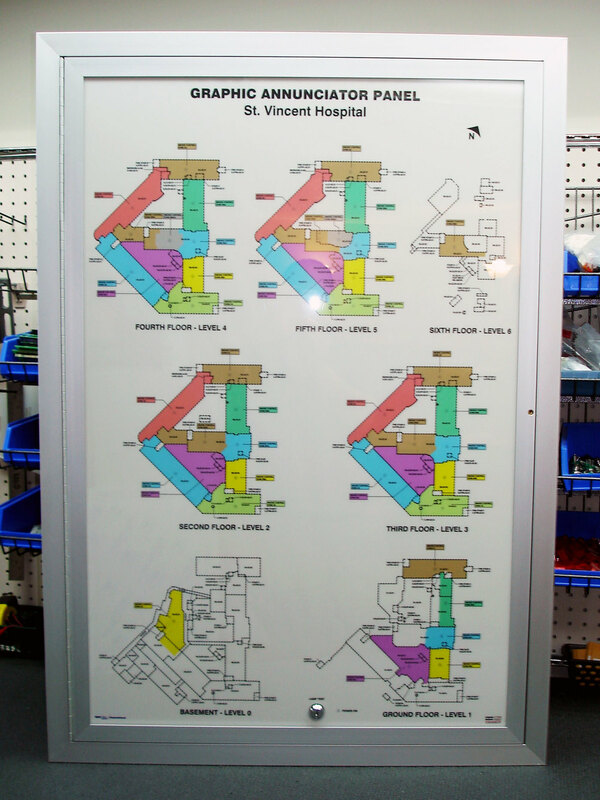 The graphic display is printed with UV inks onto a translucent backlit slip sheet film. This graphic film can be easily replaced in the field with a new film. A clear lexan lense cover protects the graphics and LED’s from damage. Unlimited graphic color selection is available at no extra charge. The graphic is illuminated with long-life LEDs that are wired to customer supplied electronics or terminal strips which are sub-plate mounted in the enclosure. A large selection of pushbutton, toggle and key switches can be incorporated into the graphic to meet customers requirements. 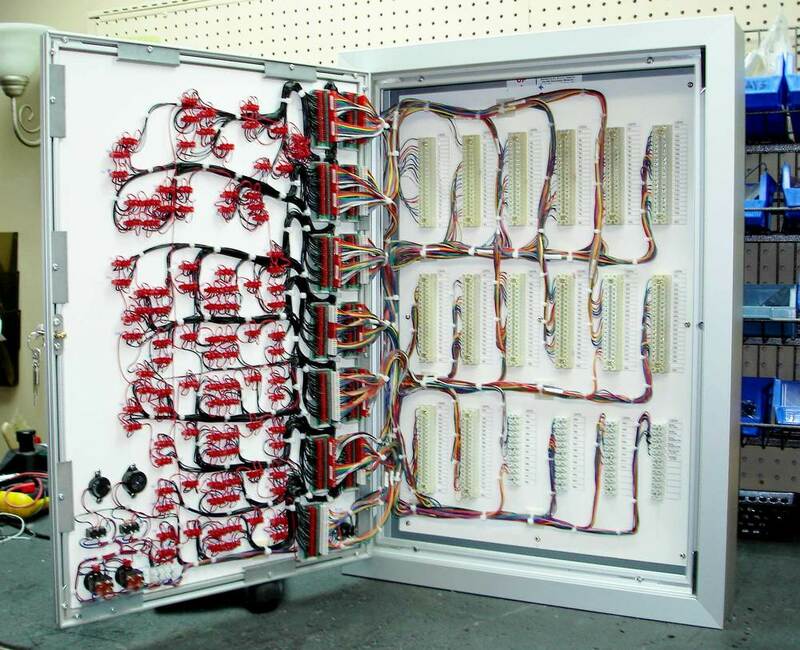 Attractive, heavy-duty, extruded aluminum cabinets are available in multiple sizes. Low profile back box for ’flush’ or ’surface mounting. Continuous piano hinge and security cylinder lock. UL, CUL (Canadian) and California State Fire Marshal listed. Quick and easy graphic changes. 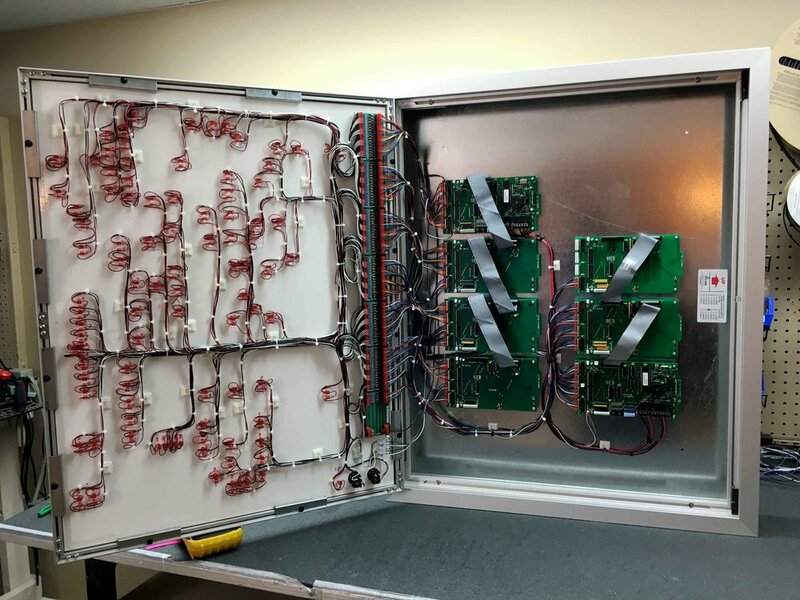 Quick-connect ribbon cables connect to customer LED driver modules. Attractive aluminum anodized cabinets available in multiple sizes. Low profile cabinet for ‘Flush’ or ‘Surface’ mounting. Security piano hinge and cylindrical door lock. UV fade-resistant graphic inks with unlimited color selection. LED’s available in five colors. Large selection of switches available, push-button, toggle, rotary & keyed. White or Black graphic background colors. Custom colors available. Custom cabinet sizes available upon request. Multiple AutoCAD font styles and linetypes available. Cut-outs for customer provided LCD displays. LEDs: Rated 20 ma, 10 ma Optional. Resistors: 680 ohm 1/4 watt, 1.2 K 1/2 watt. and 2.4K 1/2 watt. 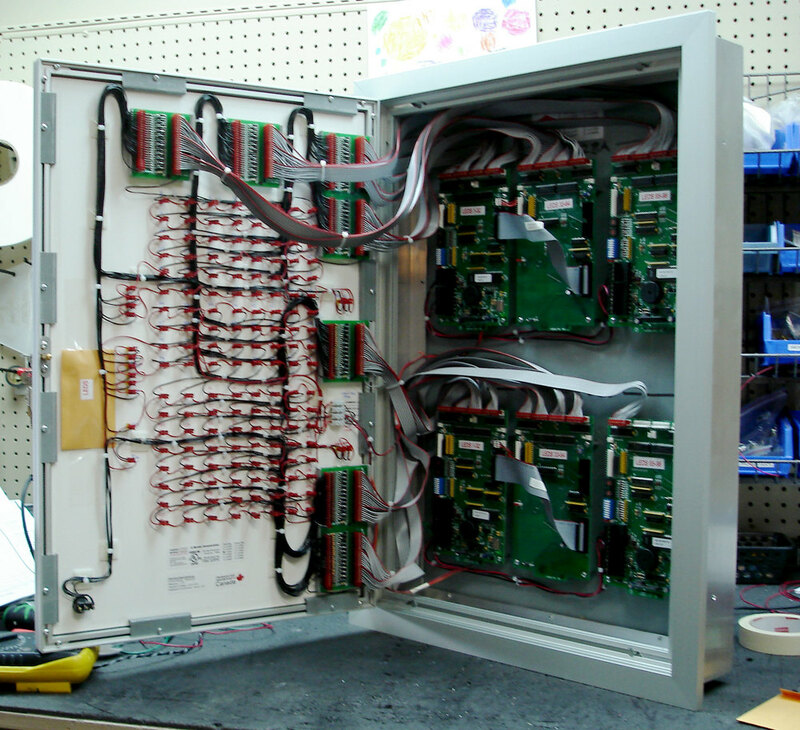 Mounting and wiring of customer provided driver assemblies. Heavy duty anodized aluminum cabinets. Cabinet assembly consists of three parts: Door, Frame and Back Box. Door is attached to Frame via a left hand piano hinge. Electrical Contractor to punch own holes for incoming conduit. Customer provided driver assemblies mount onto metal stand-offs and screws pre-installed in back box. Graphic is securely mounted to door by means of metal clips and screws. Cabinets can be mounted vertical or horizontal.